On New Year’s Eve Day, my sister and her boyfriend came in to town to visit. They wanted to see MOMA, which I had never been to. After watching someone play the piano FROM THE INSIDE, learning how to make meringue, and seeing a project that my friend worked on, we decided to grab a bite to eat. Not willing to spend the money on the Modern we stopped at Terrace 5, which presents itself as a slightly more casual yet still high-end eatery. 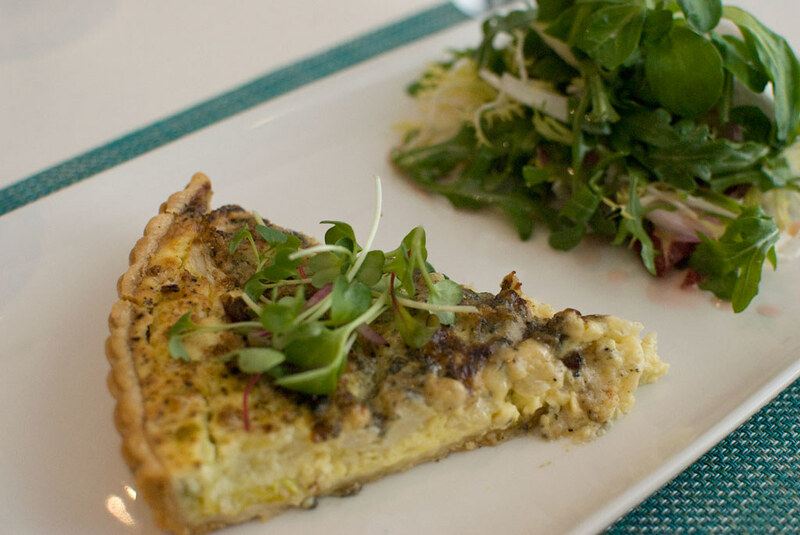 Witness the cauliflower and blue cheese quiche, artfully plated (if you’ll excuse the pun) with a salad of micro-greens ($11). Well prepared but nothing special, this museum fare is a lot better than that of another famous NYC museum, which made me violently ill afterward. I’ll leave it to you to speculate which museum that was.